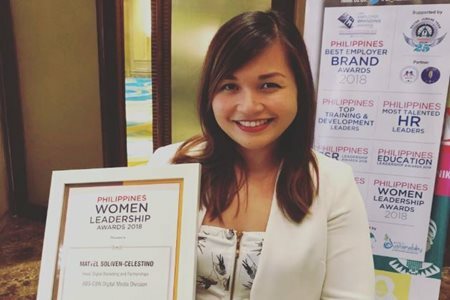 ABS-CBN’s digital marketing solutions head Mattel Soliven-Celestino was awarded a Philippines Women Leadership Award recently by CMO Asia, an organization of Asia’s top marketing executives and professionals, for her role in contributing to the country’s economic development. The award, which recognizes and appreciates the “profound role played by women as leaders, executioners, and decision makers, in shaping the future of the region and nation,” was presented to her during a recent gala hosted by the Employer Branding Institute and World HRD Congress at the Dusit Thani Hotel in Manila. Mattel heads the digital marketing solutions arm of ABS-CBN’s Digital Media Division (DMD) starting this year; Her team provides customized, creative, data-driven solutions and end to end digital marketing strategies and executions for partners while collaborating with ABS-CBN’s various lines of businesses for integrated marketing campaigns. Ongoing campaigns that her team have recently launched on ABS-CBN’s digital properties include Dove’s campaign on women who defy expectations and norms set by society, along with collaborating with media and creative agency partners on the production of Royal’s #MastersOfKulit digital campaign featuring some of ABS-CBN’s in demand artists on social media. The team has also produced campaigns and pitches for brands like Unilever, Coca-Cola, Globe, Ayala Group, Profriends, Resorts World, Sun Life, Jollibee, Cebu Pacific, among many others and maneuver partnerships with global media giants like Google, Facebook, Viber, and various ad networks and companies for digital campaigns that maximize ABS-CBN’s various platforms. Mattel also championed the monetisation and marketing of DMD’s Programmatic arm back in 2016, which drives digital ad sales using data-driven analytics for ABS-CBN, which is rapidly transitioning into an agile digital company. Prior to joining ABS-CBN, Mattel was an Associate Business Group Director in MRM-McCann and championed award-winning digital campaigns with her team, along with overseeing the rapid business growth of the brands that she handled during her time in the agency. “It’s an honor to be given this recognition. We want to be able to continue to offer the best innovative practices, campaigns, and technology to both our partners and our audiences and position ABS-CBN as a credible partner when it comes to digital advertising and digital marketing. This award validates our work as a team, and inspires me to do more and give the best to my team, the organization, and our audiences,” she said. The awardees were chosen by an independent jury that consists of senior leaders, researchers, and academicians from the Asia-Pacific region. The categories of the winners fit criteria including building sustainable leadership pipelines in organizations, storytelling, gender specific specialization at work, empowerment, social change, and ability to influence.